Python developer writes server-side web application logic. 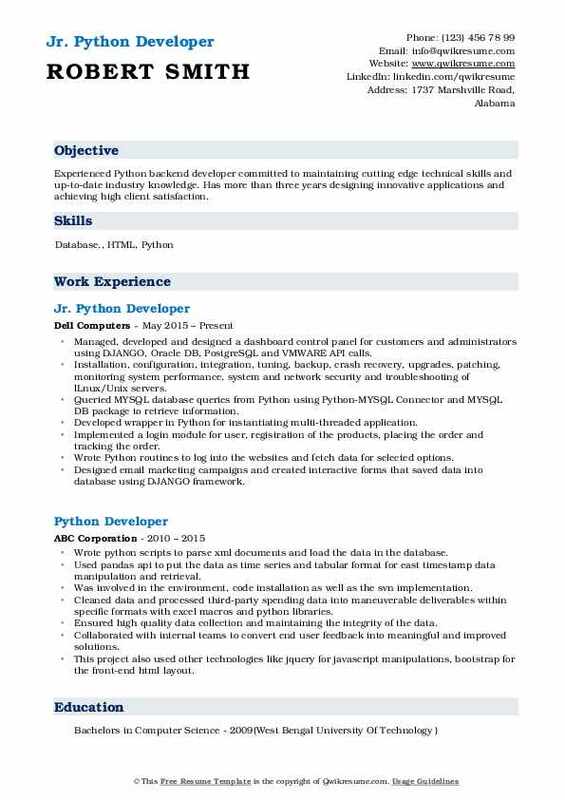 The other job duties that are incorporated and included in the Python Developer Resume include – developing back-end components, connecting applications with other web services, supporting front-end developers, writing reusable, testable and efficient code; implementation of security or data protection, developing and designing low-latency performance applications, integration of data storage systems and integration of user-facing elements that are developed by front-end developers. 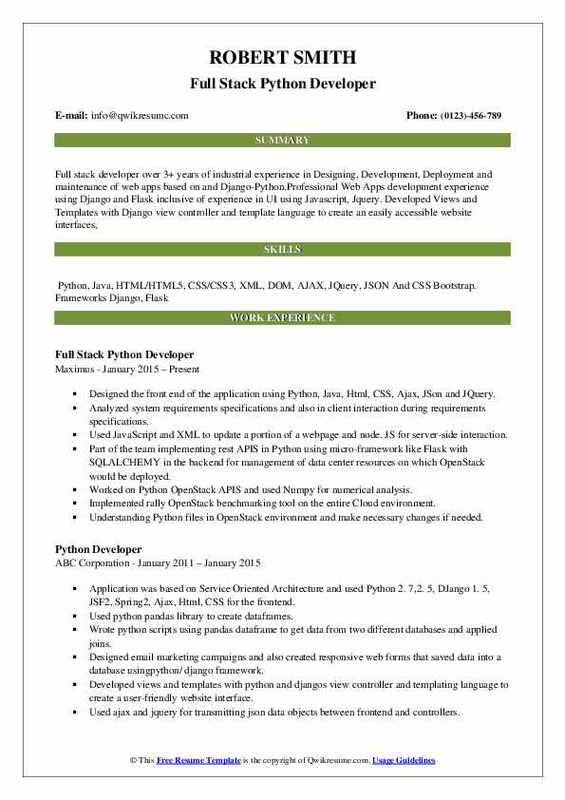 The job post requires skills and qualifications such as – experience in the python web framework, the ability to integrate multiple data source, understanding of threading limitations, and a basic understanding of various front-end technologies like HTML, JAVA, and CSS 3 and a good understanding of server-side template languages. 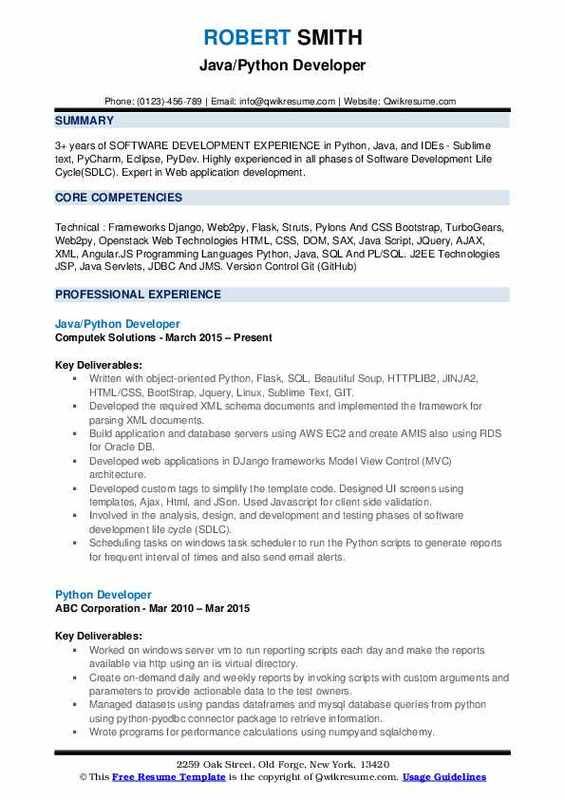 Most of the eligible resumes for this job role depict a degree in computer science or the related. 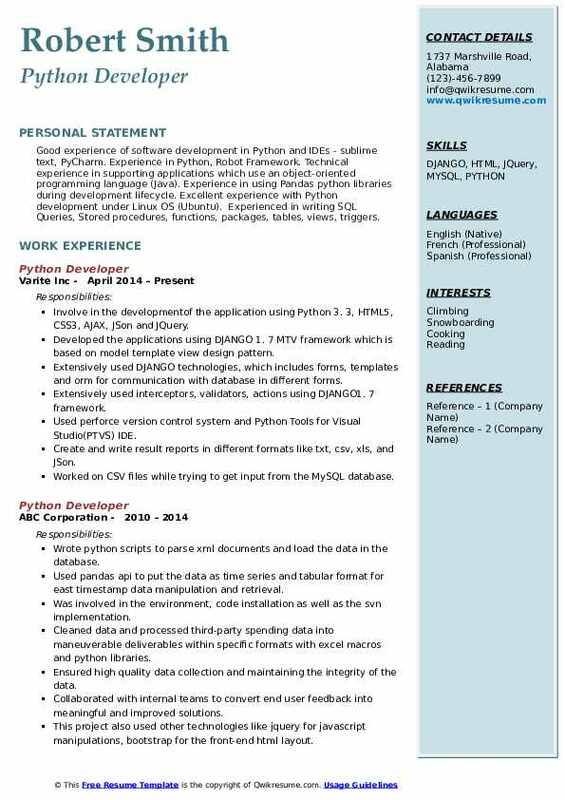 Objective : Around 5 years total IT experience as a software engineer and Python Developer and Salesforce Platform. Extensive experience in Python Django web frame works in implementing MVC architecture. Involved in requirement gathering, analysis, design, estimation and testing of the assigned tasks in openstack. Implemented rally openstack benchmarking tool on the entire cloud environment. Experience in reviewing python code for running the troubleshooting test-cases and bug issues. Configuring and managing openstack components such as Keystone, Nova, Neutron, Glance, Swift, Heat. Written Nova, Glance, Neutron, Cinder, Keystone, Hashboard, Swift, Python client api to integrate with existing application. Create a strategic architectural design of the platform with networking (VLANs, Firewalls, Load Balancers), Hypervisors (KVM and VMware), workflow and orchestration (Openstack APIS, Smart Cloud Orchestrator), Security (Keystone, lDAP), Inventory and monitoring, licensing, backup/restore. Understanding Python files in openstack environment and make necessary changes if needed. Involve in the development of the application using Python 3. 3, HTML5, CSS3, AJAX, JSon and JQuery. 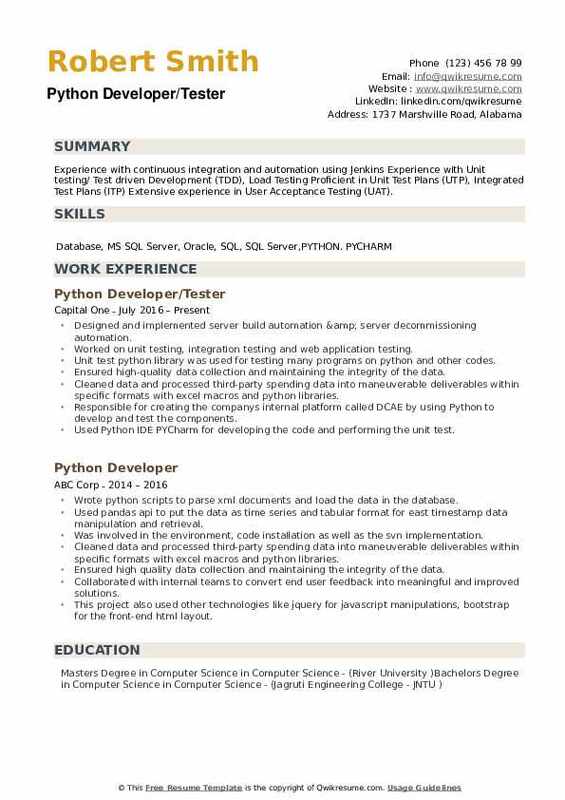 Objective : 3+ years of SOFTWARE DEVELOPMENT EXPERIENCE in Python, Java, and IDEs - Sublime text, PyCharm, Eclipse, PyDev. Highly experienced in all phases of Software Development Life Cycle(SDLC). Expert in Web application development. Build application and database servers using AWS EC2 and create AMIS also using RDS for Oracle DB. Developed web applications in DJango frameworks Model View Control (MVC) architecture. Scheduling tasks on windows task scheduler to run the Python scripts to generate reports for frequent interval of times and also send email alerts. Analyzed system requirements specifications and also in client interaction during requirements specifications. Part of the team implementing rest APIS in Python using micro-framework like Flask with SQLALCHEMY in the backend for management of data center resources on which OpenStack would be deployed. Headline : Technology and business visionary with 3+ years of Software Engineering Experience in Analysis, Designing, Developing, Testing, Automation, Customization, Bug fixes, Enhancement and Implementing of various stand-alone and client-server architecture based enterprise applications. Experience in Object Oriented Analysis in developing server side and front-end framework using various design patterns. Automated moving the tests from production to staging and staging to production by reading the keywords from NVbugs. Consumed APIS and used Python requests to read json reports and file automatic bugs in the NVbugs (nvidias internal bug filing/tracking system) for intermittent tests. Designed and configured database and backend applications and programs. Experienced in designing test plans and test cases, verifying and validating web based applications. 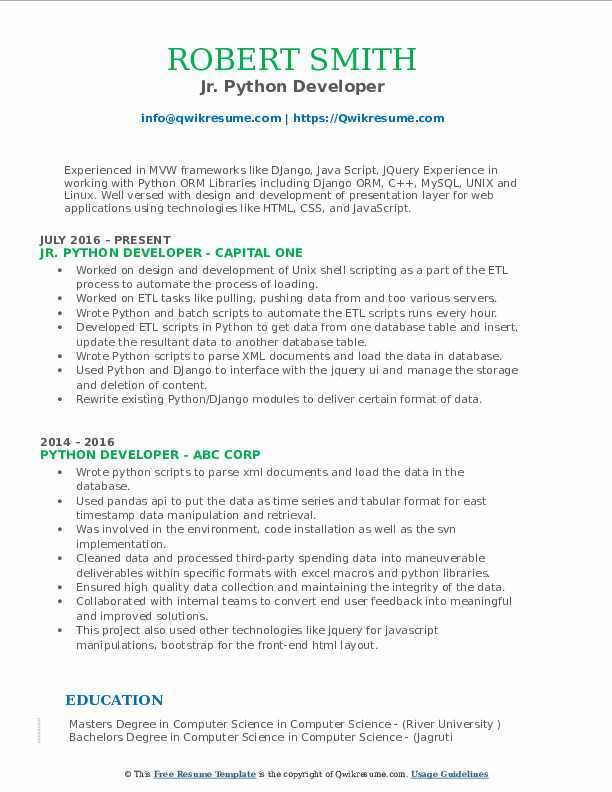 Objective : Good experience of software development in Python and IDEs - sublime text, PyCharm. 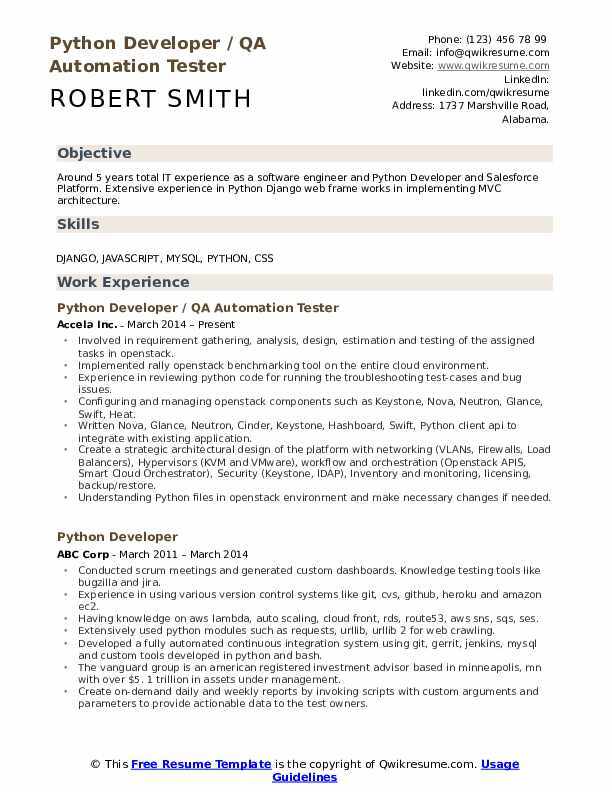 Experience in Python, Robot Framework. Technical experience in supporting applications which use an object-oriented programming language (Java). Experience in using Pandas python libraries during development lifecycle. Excellent experience with Python development under Linux OS (Ubuntu). Experienced in writing SQL Queries, Stored procedures, functions, packages, tables, views, triggers. Involve in the developmentof the application using Python 3. 3, HTML5, CSS3, AJAX, JSon and JQuery. Developed the applications using DJANGO 1. 7 MTV framework which is based on model template view design pattern. Extensively used DJANGO technologies, which includes forms, templates and orm for communication with database in different forms. Extensively used interceptors, validators, actions using DJANGO1. 7 framework. Used perforce version control system and Python Tools for Visual Studio(PTVS) IDE. Create and write result reports in different formats like txt, csv, xls, and JSon. Worked on CSV files while trying to get input from the MySQL database. Headline : Experienced Python backend developer committed to maintaining cutting edge technical skills and up-to-date industry knowledge. Has more than three years designing innovative applications and achieving high client satisfaction. Installation, configuration, integration, tuning, backup, crash recovery, upgrades, patching, monitoring system performance, system and network security and troubleshooting of lLnux/Unix servers. Queried MYSQL database queries from Python using Python-MYSQL Connector and MYSQL DB package to retrieve information. Implemented a login module for user, registration of the products, placing the order and tracking the order. Wrote Python routines to log into the websites and fetch data for selected options. Designed email marketing campaigns and created interactive forms that saved data into database using DJANGO framework. Worked on design and development of Unix shell scripting as a part of the ETL process to automate the process of loading. Worked on ETL tasks like pulling, pushing data from and too various servers. Wrote Python and batch scripts to automate the ETL scripts runs every hour. Developed ETL scripts in Python to get data from one database table and insert, update the resultant data to another database table. 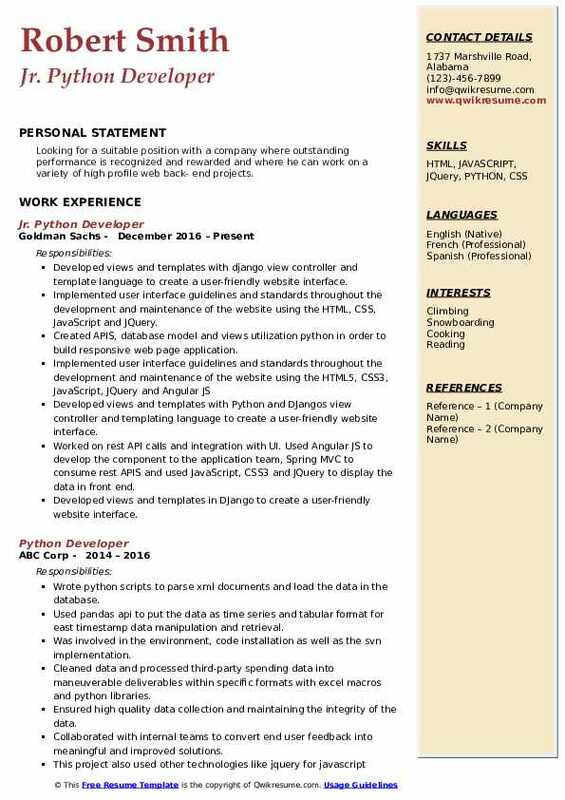 Objective : Extensive experience as a Web/Application Developer and coding with analytical programming using Python, Django, Flask and C++, Big Data/Hadoop technology. 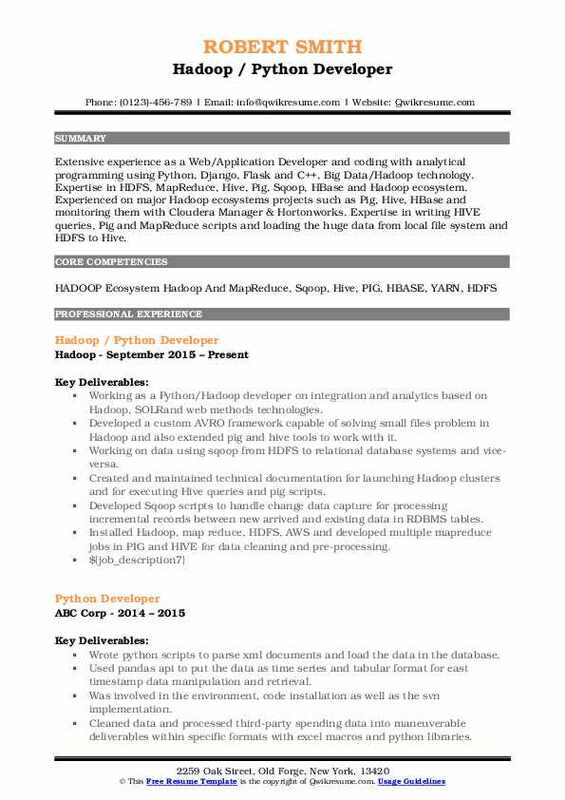 Expertise in HDFS, MapReduce, Hive, Pig, Sqoop, HBase and Hadoop ecosystem. Experienced on major Hadoop ecosystems projects such as Pig, Hive, HBase and monitoring them with Cloudera Manager & Hortonworks. Expertise in writing HIVE queries, Pig and MapReduce scripts and loading the huge data from local file system and HDFS to Hive. 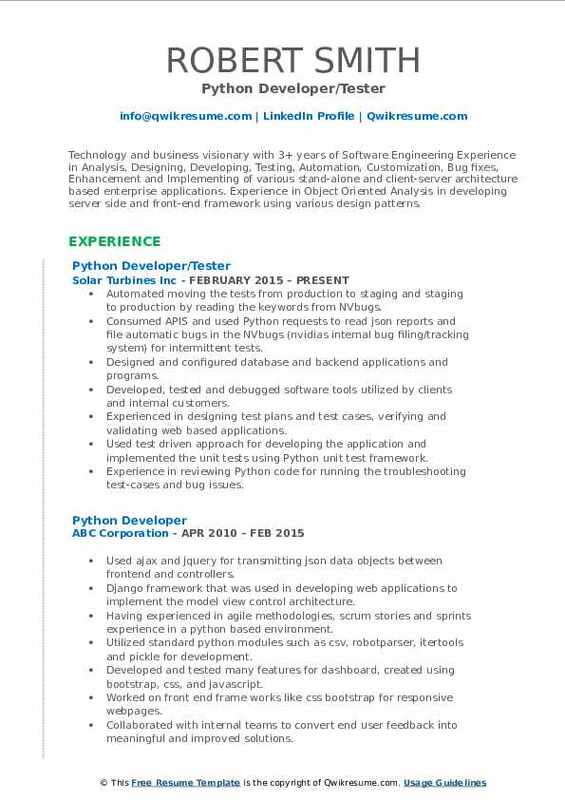 Working as a Python/Hadoop developer on integration and analytics based on Hadoop, SOLRand web methods technologies. Developed a custom AVRO framework capable of solving small files problem in Hadoop and also extended pig and hive tools to work with it. Working on data using sqoop from HDFS to relational database systems and vice-versa. Installed Hadoop, map reduce, HDFS, AWS and developed multiple mapreduce jobs in PIG and HIVE for data cleaning and pre-processing. Objective : Looking for a suitable position with a company where outstanding performance is recognized and rewarded and where he can work on a variety of high profile web back- end projects. Created APIS, database model and views utilization python in order to build responsive web page application. Developed views and templates with Python and DJangos view controller and templating language to create a user-friendly website interface. Developed views and templates in DJango to create a user-friendly website interface. Objective : Experience with continuous integration and automation using Jenkins Experience with Unit testing/ Test driven Development (TDD), Load Testing Proficient in Unit Test Plans (UTP), Integrated Test Plans (ITP) Extensive experience in User Acceptance Testing (UAT). Designed and implemented server build automation & server decommissioning automation. Worked on unit testing, integration testing and web application testing. Ensured high-quality data collection and maintaining the integrity of the data. Cleaned data and processed third-party spending data into maneuverable deliverables within specific formats with excel macros and python libraries. Responsible for creating the company's internal platform called DCAE by using Python to develop and test the components. Used Python IDE PYCharm for developing the code and performing the unit test.